Larry and I biked Holy Cross. I almost cleaned the crux... he did. Dalton and I set out to do the Crestone Traverse from Peak to Needle. Took off after work on Friday drove straight through and arrived at midnight and slept in the parking lot at the trail head. Up at 6 am we started hiking. Above South Colony Lakes we encountered a herd of big horn sheep including a couple of lambs. There are a couple of snow fields you must cross, but they are well traveled enough to not need an ice ax for safety. A crew is working on the trail at Broken Hand Pass, which is good because the loose rock and dirt is annoying to climb. After reaching the pass I took a wrong turn and headed straight for the Crestone Needle. We planned to climb the Crestone Peak first so we had to backtrack about a half mile. You head down into the very beautiful valley to approach Cottonwood lake. As we started the ascent of the Peak we could see that the Red Couloir still had a lot of snow. There were climbers kicking steps and making slow progress. We decided to climb the rocks to the left of the couloir since Dalton did not bring an axe. The climbing here is excellent and fun. The route finding is fairly straightforward, but you can venture into Class 4 or better moves. On top of the Peak there was only one other gentleman. We had a sandwich and enjoyed the views of the San Luis Valley and the Great Sand Dunes National Park. You must descend quite a ways in order to find the exit ramp to engage the traverse to the Needle. Using Cooper's way points we found the exit and made our way across following cairns. We found the second way point to be at N37 57.961 W10534.648 of the traverse. We encountered a steep snow field we had to cross and Dalton slipped into an ice crack. Luckily he made a nice self arrest using his knees and hands. I slipped in the same place and nearly pulled out the knob I was holding on to. From here Dalton and I got separated for a bit as I was angling for the third way point and he was following his own line. The way gives up even more altitude as you make your way across. To make matters worse my satellite coverage was cutting out. In the end, the picture Dave has in his book would have been worth more than the way point. We had traversed too far around to the South and ended up climbing the south face. Rather than ending the climb with the steep Class 4 of the SW face, we encountered some low Class 5 pitch 300 feet lower (N37 57.823 W105 34.648, 13,855ft.). 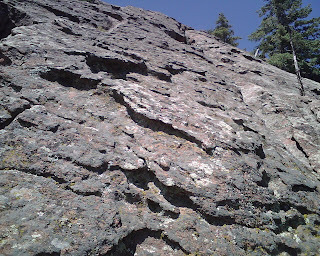 The rock was steep but solid and we finished the route with easier climbing to the summit. We left the Needle summit at 6:30 PM. Our climbing was far from over. The descent down the eastern couloir was more difficult than I remembered it. This even required a few facing-inward downclimbs for me. The hour was getting late as we made our way down Broken Hand Pass. I removed my ice axe to help in crossing the snow fields which felt less secure going down than up. As it grew dark we still had a quarter of a mile to the camp sites by the lake. We lost the trail and thrashed about for over an hour before finding it again. Again we lost the trail, but this time knew better than to try and make it by bushwacking. The bushes here are much too thick with many gullies to trap you. To make things surreal we witnessed some very strange flashlights that seemed to hover and dash much too quickly across the valley floor. It must have been my tired mind playing tricks on me, but Dalton seen them too. Finally we made it to the campsites and the trail was easier to follow. We trudged in the dark back to the parking lot arriving at midnight. No campfire for us tonight either after an 18 hour day! After losing my wedding ring during a hike/ascent of Hammerhead's Yodeling Moves, I needed to get back up on the rock as soon as possible. I took off from work early on a Tuesday to make my way to Boulder. 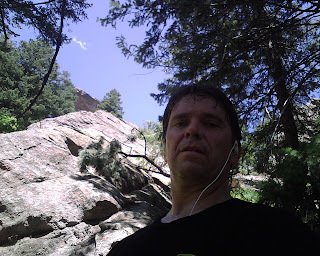 This time I started at NCAR and did a trail run approach sans backpack. My new Scarpa approach shoes are perfect for a run/scramble combo. The photo above is me at the bottom of Hammerhead. This photo shows the nice holds this rock has. The second time up Yodeling Moves and the East Face of the Last Flatiron was just as enjoyable as the first. I hope to find my ring, but if not it will make a good excuses to keep returning to these nice climbs. This time I added on Fern Alley. This Class 3 scramble starts just as the Last Flatiron ends and is aptly named: A rock canyon with lots of ferns. Check out this photo of Hammerhead... this rock so much nicer to climb than the brittle sandstone around where I grew up in western Colorado. I think one could combine the Casino Royale, Yodeling Moves, Last Flatiron, and Fern Alley for an awesome day of climbing. I didn't find my ring, so maybe that's what I will try next time. 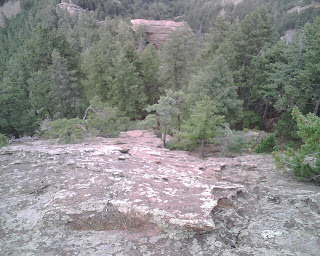 This photo shows the last pitch on the Last Flatiron. You can see the huge dead tree poking out at the top. Scouring my Flatiron Classics book for a new scrambling route I happened upon a climb called Yodeling Moves. 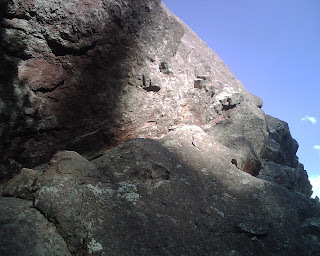 This route is on a rock called Hammerhead which is in the area of the fourth flatiron on Green Mountain. I took the Royal Arch trail from Chattaqua Park. The bottom of Hammerhead just down from Sentinel Pass to the west of the trail about 50 feet. I forgot my GPS... but I will get coordinates next time. Half the fun is finding it for yourself anyway. The climbing on Hammerhead is very enjoyable as you travel over a long arch. The holds are plentiful and secure, but if you look down too long you may feel a bit nervous without a rope. 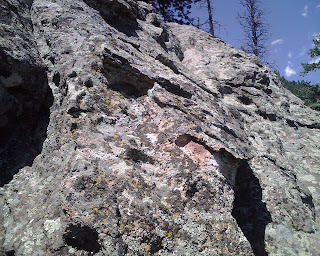 This is Class 4 territory and climbing this free solo without a partner always makes me pay close attention (photo 1). This second photo shows the route to the summit of Hammerhead on the west side that gives Yodeling Moves its name. 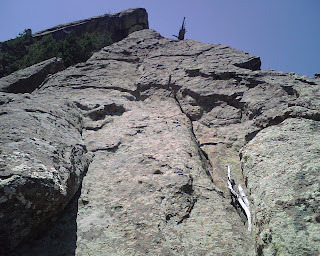 I continued on up to the Last Flatiron's East Face. This is more Class 4 climbing (photo 3) and is very enjoyable as well. 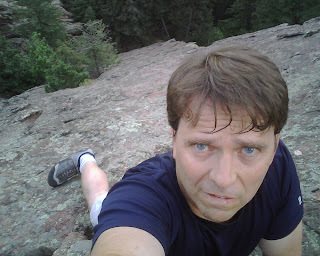 The angle of the rocks in the flatirons makes climbing easy on the muscles. As you reach the summit, the downclimb would look a bit dubious were it not for the dead tree that is positioned perfectly. I can't imagine anyone placing this large tree here, so it is was awfully lucky for it to land so fortuitously. What was not so fortuitous was my lost ring. I had taken off my wedding ring and put it in my pocket. Somewhere along the way it came out. I'm making it my mission to keep climbing these rocks until I find the damned thing.